OG Town-Wide Yard Sale. Blogfinger photograph. TO SEE THE LIST OF YARD SAILORS, INCLUDING ITEMS FOR SALE, CLICK ON THE YARD SALE TAB AT TOP OF THIS DISPLAY. Note: The true number of sellers will be larger, because some will set up on our coat-tails without actually signing onto the list. And some addresses contain more than one family. Bring Mom to Ocean Grove for the sale. She will love shopping and chatting with those friendly Grovers. Visitors can access the list on their mobile devices by going to WWW.Blogfinger.net and clicking on the yard sale tab at the top of the page. Visit our sale sites on foot, by bike, or by automobile. OG map is found by clicking on the yard sale tab above. Any questions, call our Sale Manager Vincent Cannavo 732 735 0409. Camp Meeting Association bathrooms will be open on May 12, across from the Great Auditorium. 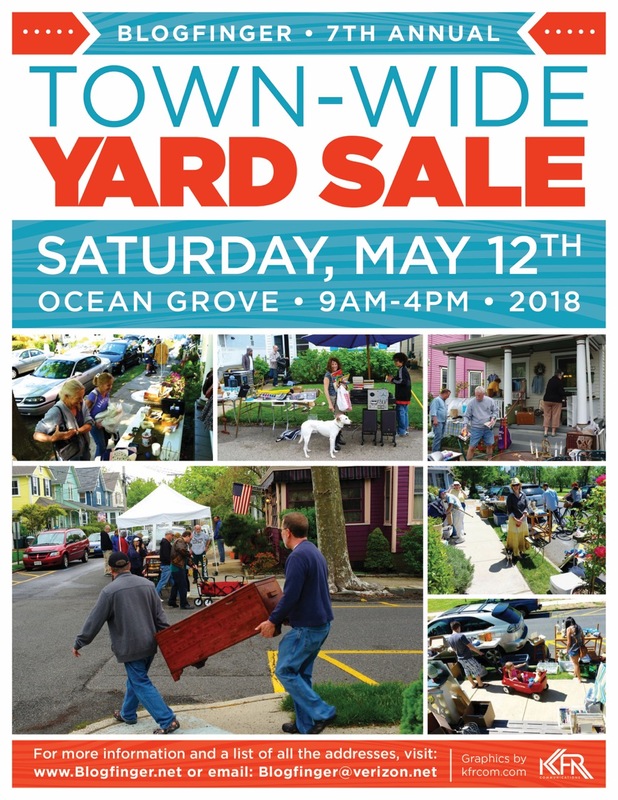 7th annual Ocean Grove Town-Wide Yard Sale: Saturday, May 12. Now is a good time to begin the process of collecting items for sale. If you want to sign up, contact us at Blogfinger@verizon.net. For more information please click on the Yard Sale tab at the top of this page. We just received our updated TWYS fliers, skillfully prepared by Andrew Gioulis of KFR Comunications. Thank you Andrew. These fliers would make a nice wall decoration for your OG house. We’ll let you know when they are available. Whether you are a participant or a shopper, please mark your calendars. 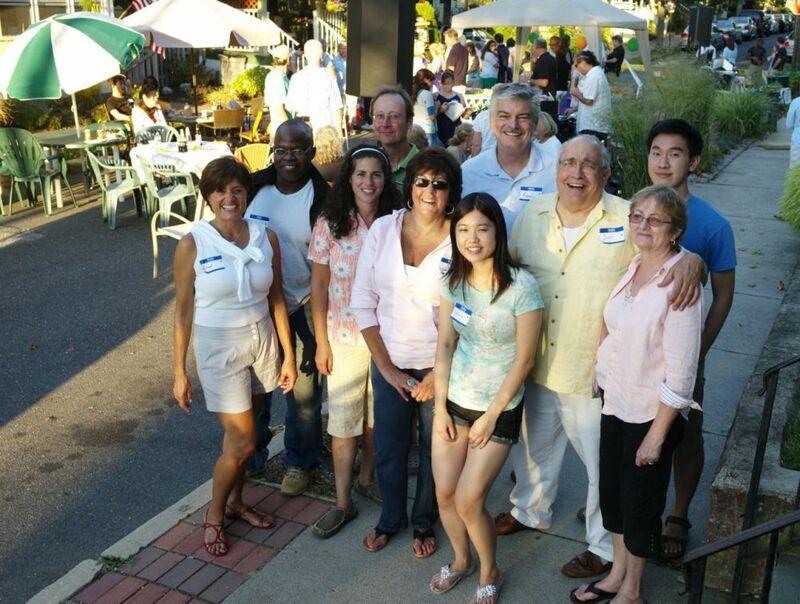 The more sellers and buyers= a more successful event. We would like to break the shore record. If you Google “Which Jersey Shore towns have the most successful town-wide yard sale,” Ocean Grove is listed #1. In an APP article last year, OG ‘s TWYS was listed with Asbury Park’s, but we had more participants. Other travel sites picked us up including Delaware On-Line, Event Crazy.com, NJ.com, and others, but unfortunately the OGCMA refused outright to help our citizens promote this event, confirming the problem between the populace and the entrenched CMA. And the Chamber of Commerce said that our town-wide sale would be bad for their businesses, so they wouldn’t help. We advertise each year in the Coaster, Craig’s List, and the APP. We welcome any volunteers who have ideas about marketing. No one makes any money on this event except the sellers. If you think you’ve heard this song before, you are correct, but predictable repeats of traditions can be reassuring and beneficial. 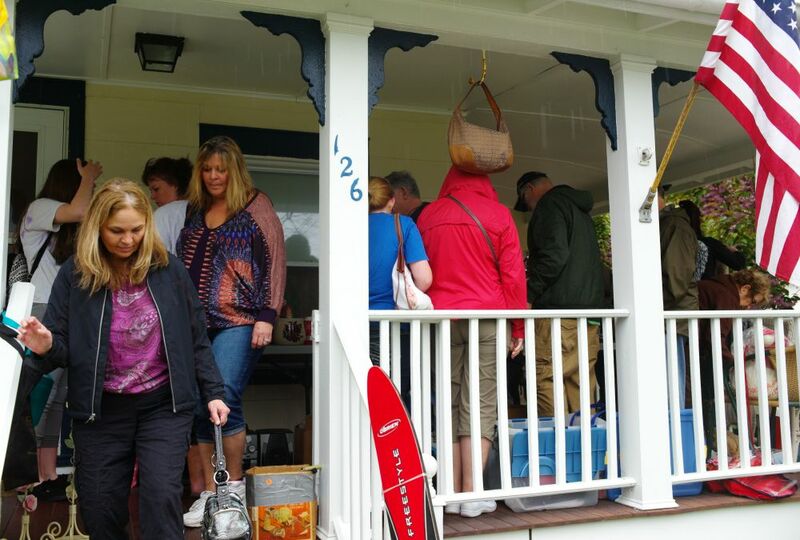 ANNOUNCING THE 7TH ANNUAL OG TOWN-WIDE YARD SALE: SATURDAY MAY 12, 2018. Ocean Grove Town-Wide Yard Sale. Paul Goldfinger photo. Blogfinger.net © 2014. We will be having the 7th Annual Town-Wide Yard Sale on SAturday, May 12, 2018, from 9 am to 4 pm. Blogfinger will be sponsoring the tradition. .
We will need some more volunteers—-Grovers will be needed to monitor the sale on that Saturday by riding around town on bikes checking on the participants. Other tasks: print fliers, hand out fliers, take photographs of sales that day, place some signs around town (entrances etc,) , and we are open to suggestions/ideas to promote the event. Think about getting some fliers from us and placing them wherever–eg church, meeting halls, other towns nearby, on your home, etc. Get the kids to set up lemonade stands. Mark your calendars now and think about having a sale. Notify us with your name, address, cross street, and email for now. Items for sale can be added later. Groupings of sales attract more shoppers. 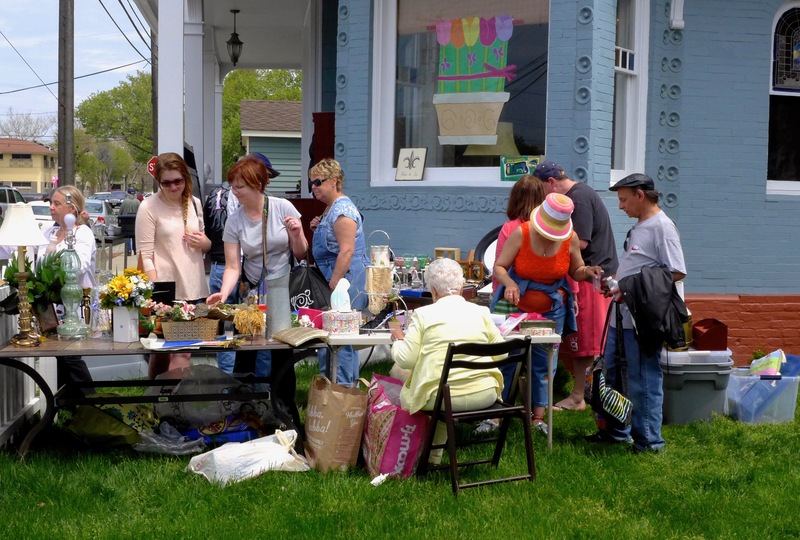 Our Town-Wide Yard Sale attracts out-of-towners, but it is never a deluge. Parking is not a problem on the Saturday of the Mother’s Day weekend, and it is great fun to walk around with Mom. 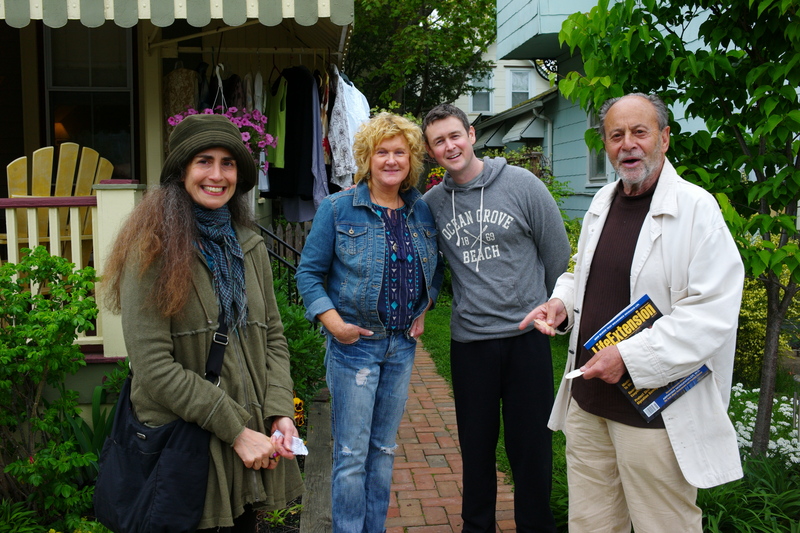 It is people strolling strolling through our town visiting our beautiful neighborhoods and chatting with the locals. It is as much a social event as it is a sale and it is the sort of activity that promotes a sense of community, unlike the massive, grid-locking events that we are used to in OG. As before, we will establish a page on Blogfinger to list all the sellers and, eventually, their list of items. We will provide links for visitors to find on their cell phones that will offer maps of the Grove and the official sellers list. We will advertise on BF, Coaster, APP, Camp Meeting* Booklet and electric sign, word-of mouth (tell your friends,) and any other way that you might suggest. Don’t forget that you will need a Yard Sale permit. More details will follow. We will schedule a meeting at the Blogfinger headquarters in March to discuss details with volunteers. Stay tuned. * The CMA refused this request.